Ans: A Data warehouse is a subject oriented, integrated ,time variant, non volatile collection of data in support of management's decision making process. Ans: A database is a collection of related data. Where as Data Warehouse stores historical data, the business users take their decisions based on historical data only. Ans: A dimension table consists of tuples of attributes of the dimension. A fact table can be thought of as having tuples, one per a recorded fact. This fact contains some measured or observed variables and identifies them with pointers to dimension tables. Ans: Data mining - analyzing data from different perspectives and concluding it into useful decision making information. It can be used to increase revenue, cost cutting, increase productivity or improve any business process. There are lot of tools available in market for various industries to do data mining. Basically, it is all about finding correlations or patterns in large relational databases. Ans : A data mart is a simple form of a data warehouse that is focused on a single subject (or functional area), such as Sales, Finance, or Marketing. Data marts are often built and controlled by a single department within an organization. Given their single-subject focus, data marts usually draw data from only a few sources. The sources could be internal operational systems, a central data warehouse, or external data. Ans: Online transactional processing (OLTP) is designed to efficiently process high volumes of transactions, instantly recording business events (such as a sales invoice payment) and reflecting changes as they occur. Online analytical processing (OLAP) is designed for analysis and decision support, allowing exploration of often hidden relationships in large amounts of data by providing unlimited views of multiple relationships at any cross-section of defined business dimensions. Ans: ETL - extract, transform, and load. Extracting data from outside source systems. Transforming raw data to make it fit for use by different departments. Loading transformed data into target systems like data mart or data warehouse. Ans: To verify the correctness of data transformation against the signed off business requirements and rules. To verify that expected data is loaded into data mart or data warehouse without loss of any data. To validate the accuracy of reconciliation reports (if any e.g. in case of comparison of report of transactions made via bank ATM – ATM report vs. Bank Account Report). 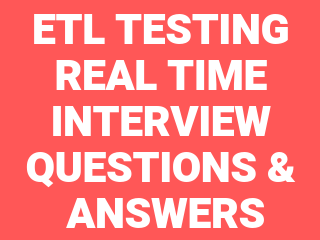 Ans :An ETL tester is responsible for writing SQL queries for various scenarios. They run a number of tests including primary key, duplicate, default, and attribute tests of the process. In addition, they are in charge of running record count checks as well as reconciling records with source data. They also confirm the quality of the data and the loading process overall. 21. List out the employees who are not receiving commission. 22. List out the employee id, last name in ascending order based on the employee id. 25. list out the employee details according to their last_name in ascending order and then on department_id in descending order. 28. List out the job wise maximum salary, minimum salary, average salaries of the employees. 29. List out the no.of employees joined in every month in ascending order. 30. List out the no.of employees for each month and year, in the ascending order based on the year, month. Ans: Select to_char(hire_date,’yyyy’) Year, to_char(hire_date,’mon’) Month, count(*) “No. of employees” from employee group by to_char(hire_date,’yyyy’), to_char(hire_date,’mon’).